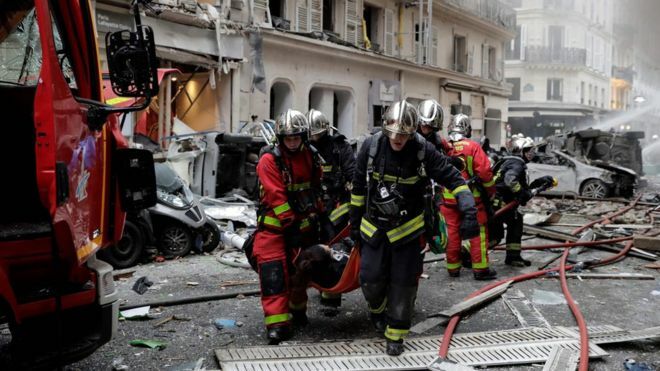 Firefighters are tackling a blaze in a business in the centre of Paris after a powerful explosion which injured a number people. Police suspect a gas leak caused the explosion which occurred in a bakery around 09:00 (08:00 GMT). They have asked people to stay away from the area, to allow emergency services access. In the immediate aftermath, smashed cars and debris from other shop fronts littered the street in front of the burning bakery as people stood around, looking stunned by the force of the explosion. Paris and other French cities have been bracing themselves for a new round of anti-government protests by "yellow vest" demonstrators, with 80,000 police officers due to be on duty on Saturday - although the explosion is not thought to be connected with the demonstrations.